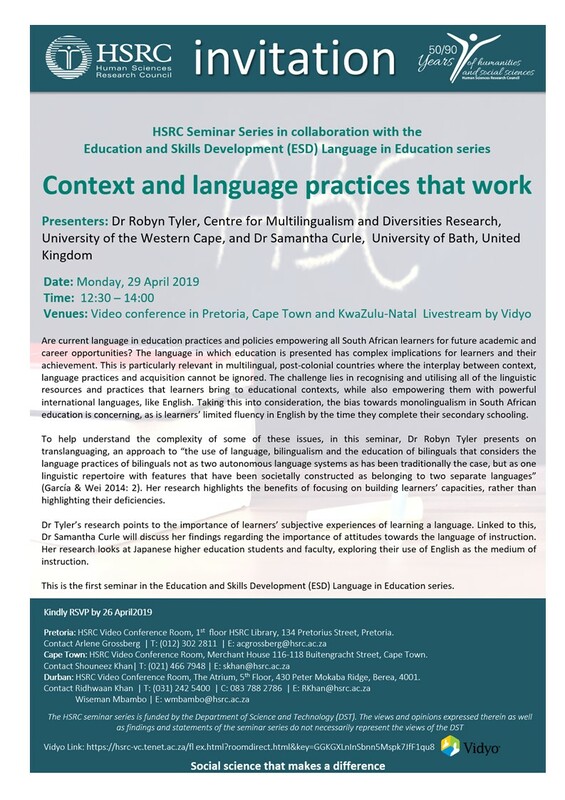 Are current language in education practices and policies empowering all South African learners for future academic and career opportunities? The language in which education is presented has complex implications for learners and their achievement. This is particularly relevant in multilingual, post-colonial countries where the interplay between context, language practices and acquisition cannot be ignored. The challenge lies in recognising and utilising all of the linguistic resources and practices that learners bring to educational contexts, while also empowering them with powerful international languages, like English. 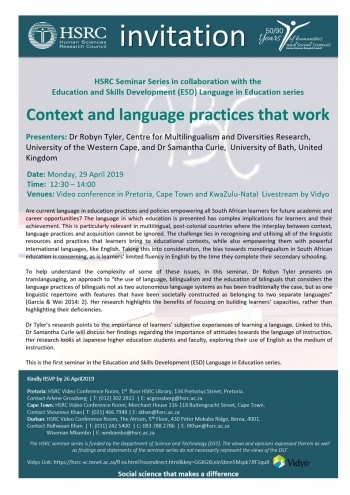 Taking this into consideration, the bias towards monolingualism in South African education is concerning, as is learners’ limited fluency in English by the time they complete their secondary schooling. To help understand the complexity of some of these issues, in this seminar, Dr Robyn Tyler presents on translanguaging, an approach to “the use of language, bilingualism and the education of bilinguals that considers the language practices of bilinguals not as two autonomous language systems as has been traditionally the case, but as one linguistic repertoire with features that have been societally constructed as belonging to two separate languages” (García & Wei 2014: 2). Her research highlights the benefits of focusing on building learners’ capacities, rather than highlighting their deficiencies. Dr Tyler’s research points to the importance of learners’ subjective experiences of learning a language. Linked to this, Dr Samantha Curle will discuss her findings regarding the importance of attitudes towards the language of instruction. Her research looks at Japanese higher education students and faculty, exploring their use of English as the medium of instruction. This is the first seminar in the Education and Skills Development (ESD) Language in Education series.